Parents have a tremendous impact on helping their children not only learn to read, but discover the joy of reading. We want to help our child find just the right book for them, but it's hard to figure out the best way to help our kid. James Patterson, best-selling author, is passionate about helping kids discover the joy of reading. He's written an op-ed piece for CNN.com, and I want to share some of it here. "Here's a simple but powerful truth that many parents and schools don't act on: The more kids read, the better readers they become. Head over to CNN.com to read more of Patterson's advice - it's worth the trip. He's absolutely right - the biggest way parents can help is connect their child with books just right for your kids' interests. You know your kid better than anyone else. Talk at the dinner table about the sort of things your kid likes. Talk about how books can be great places to explore those things. If you have a baseball-lover, fill your home with sports books, trivia books, biographies, and sports novels. Check out Dan Gutman's baseball card fantasies, Sports Illustrated's great kids books, and some of the wonderful biographies like No Easy Way! The Story of Ted Williams and the last .400 Season by Fred Bowen. James Patterson has also created a fantastic website for for parents, librarians, and teachers, and other children's book-loving souls: http://www.readkiddoread.com. The site is "dedicated to making kids readers for life;" Patterson and his team do this by bringing together a great selection of page-turners for a range of ages, from young toddlers all the way through advanced tweens and teens. Patterson's mission is to get kids hooked on books they can't put down, so they can develop an interest in reading that will lead them to other books that will launch them as lifetime readers. Breadcrumbs, by Anne Ursu (ages 9 - 14) - blog tour & giveaway! Do you ever find yourself completely taken away by a book? Perhaps it's the setting that completely enchants you? Or the characters are so real that you feel they might be your best friend or your forgotten twin? Perhaps it's that the writing is so beautiful that you find yourself continually saying, "Oh, yes..." Or it's a book you want to keep sharing with friends. I was completely taken by Breadcrumbs, by Anne Ursu, and am so excited about its release. I'm thrilled to be part of the blog tour celebrating this book. A special bonus is that Anne Ursu is offering a Skype visit for a class or book group - see below for details. Hazel just wishes that life around her would work the way it does in all the stories she reads, that she could figure out how and why everyone acts the way they do. But at her new school, they don't celebrate children with imaginations and they just want Hazel to pay attention and stop daydreaming. The only thing getting Hazel through each day of 5th grade is knowing that her best friend Jack is just across the hall. Maybe at recess they'll play together. They've been friends for years. But lately, things are changing. Jack's changing. And this is just one more thing that Hazel is having trouble figuring out. How can something, someone you know and trust, change just like that? "It snowed right before Jack stopped talking to Hazel, fluffy white flakes big enough to show their crystal architecture, like perfect geometric poems. It was the sort of snow that transforms the world around it into a different kind of place... It was the sort of snowfall that, if there were any magic to be had in the world, would make it come out. I am so looking forward to talking about this book with friends and students. 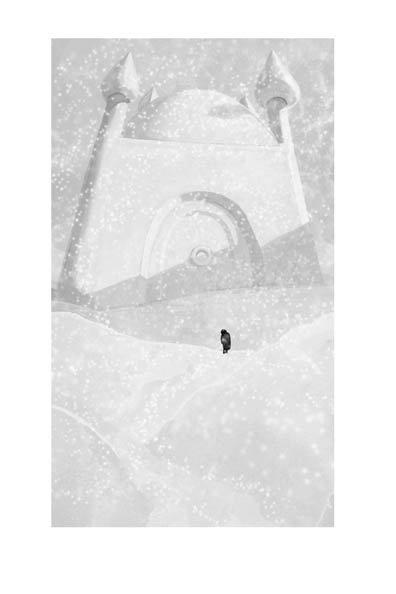 Not only does Ursu use beautiful descriptive writing to convey the snowy setting of wintry Minnesota, she also draws Hazel's interior dialog with genuine insight. I would love to talk with students about Ursu's themes of the power of imagination, the changes people go through, and the impact that stories can have on us. And yet there is much in this story that isn't quite sitting with me. Breadcrumbs was inspired by Hans Christian Andersen's story The Snow Queen. Like in that story, Jack is struck by a magical glass splinter and his heart is frozen. Jack follows the Snow Queen into the enchanted forest to live in her palace, content to be by her side, his heart (and conscience) frozen. In Breadcrumbs, Hazel follows Jack, determined to rescue him. She undergoes harsh trials in the enchanted forest, encountering different bewitched people from Andersen's stories. I'm fascinated by the way that Ursu describes Hazel's emotions toward the end of this journey. What pushes her on to find Jack? How does she keep going? If you're like me, this book will provide wonderful food for thought and lead to rich discussions with book groups or classes. Which leads me to announce a wonderful giveaway, provided by Anne Ursu and Walden Pond Press. The winner of this giveaway will receive a complimentary 30-45 minute Skype visit with author Anne Ursu! The contest is open to all teachers, librarians, and other educators (including homeschool groups) who work with children in an instructional capacity. Please keep in mind Anne’s book is written for children in grades 4-7 when submitting your entry. Class/group size must be a minimum of 10 children. One entry per educator only. You must fill out the form below to enter. Giveaway is open to US residents only. Entries must be received by 11:59 p.m. (Pacific time) October 8, 2011. Make sure to stop by other stops on the Breadcrumbs blog tour. You'll find all the links at the bottom of this page. Giveaway: Walden Books Press is celebrating the release of Breadcrumbs with a giveaway! They're giving away an iPad and an iPad cover with Breadcrumbs cover art on Twitter! Be sure to visit the Walden Pond Press blog for more details. Author Chat: On Tuesday, 10/4 at 8pm EDT Breadcrumbs author, Anne Ursu (@anneursu) and Bigger Than a Breadbox author Laurel Snyder (@LaurelSnyder) will participate in a chat hosted by my #titletalk co-host, Paul W. Hankins (@PaulWHankins), called "Magic is Real: Magic, Fantasy, and Realism in Middle Grade" under the hashtag #magicisreal. The review copy was kindly sent by Walden Pond Press / HarperCollins. I have already purchased a copy for home from my local bookstore, Mrs. Dalloway's Books. As a child, I adored listening to my mother reading aloud stories. I can remember sitting on my brother's bed, listening to her read Where the Red Fern Grows as we all got teary at the end of the story. And we loved listening to Books On Tape as a family on long drives. I know from working with many students that audiobooks helps provide an essential way into longer stories that they would not be able to read on their own. So I'm fascinated with how professional narration is combining with visual stories in Book Apps for children. How do we evaluate what makes a successful narration for book apps? Does the narration help users interact with the content? Is the narration appropriate for the content? Can you turn the narration off if you just want to read it? Is the narration available in more than one language? How Rocket Learned to Read has a wonderful narration that goes along with the story. The narrator's voice is perfectly suited to the story, and she reads at a gentle pace, allowing a young listener to absorb the story. This narration is essential, giving pre-readers access to this picture book. You can also tap individual words if you are trying to read them, and the narrator will read aloud just those words. The Magic School Bus: Oceans app also has narration that plays automatically when you swipe a page. But there are also speech bubbles from the different characters that you tap on to hear them. This helps keep readers engaged, still focused on the content and on task. One task that new readers must learn how to do is read dialog with expression, hearing the different voices in their heads. This app will help new readers develop these skills. An example of an app where the narration does not fit the content, in my view, is the National Geographic Ultimate Dinopedia app. The narrator's voice is overly dramatic for this nonfiction text, almost sensationalizing the material. Imagine a World Wide Wrestling announcer's voice narrating Life On Earth, instead of David Attenborough. I have been especially pleased to see that several book apps have made their narration and text available in more than one language. Winged Chariot's apps do a wonderful job of this. You can see below all of the languages that The Red Apple comes in: English, Spanish, Dutch, German, Polish, Italian, Chinese and more. All of these are available with the purchase of the one book, making it possible for listeners and readers to switch between languages if they are learning a new language. Other Winged Chariot apps we have enjoyed include Scruffy Kitty, The Birthday and Emma Loves Pink. The all include options for different languages. My one hope is that apps for older readers develop narrative tracks to supplement them, thus providing access to younger readers or readers who need extra support. For example, I'm fascinated by the way Journey Into the Deep explores the ocean depths. But I know that the dense text will be difficult to read for many children who are interested in the subject. A compelling narrative track would be incredibly helpful. What features of an app's narration do you think are important? Are there apps that are particularly successful with this aspect? For other articles in this series, please see Evaluating Book Apps for Children: A Mini-Series. I have been fascinated watching this new way of sharing stories and information develop right in front of my eyes. Whatever else you can say about apps, we certainly know that this field is consistently changing. What we think is fantastic and innovative in an app today, might become ordinary and assumed in the blink of an eye. Apps have been developed for a wide range of books, ranging from early baby books to picture books for older readers to nonfiction books for young and old. With each, the most important aspect to consider is the audience. In all the cases where I am considering an app, I want to think about the reader or learner it was designed for. The first criteria I think about as I open up an app is what's the user's experience with navigation? How easy is it to go from section to section? How do users discover how they find their way around the app? “Transparency, or ease of use, is clearly one of the key components to making technology successful within an educational setting” (Baule, 2007) and this clearly applies to apps as well. The Magic School Bus app has a slide-out menu at the bottom of every page that allows the user to go directly to the section or chapter they want to. So if you want to read about coral reefs, you can go right there. Users will soon discover that tapping the named elements with floating air bubbles will lead to the photos and videos. Other apps have clear directions explaining how to navigate through their pages. For example, Journey Into the Deep has a fascinating selection of symbols that guide users to digging deeper into the content of a chapter, taking you back to the table of contents, or revealing content within pictures. At the bottom of this app is a sliding scale that indicates where in the book you are at any moment. This sophisticated navigation structure allows users to explore different parts of this complex book in a way that makes sense to them, and always makes it easy to return to the table of contents. Many picture book apps will remember where readers left off reading, so when you open them they will ask you, "Do you want to resume where you left off, or start from the beginning?" Many picture book apps have a table of contents with a thumbnail picture of each page, so young pre-readers can choose the page they want to go to. This is a very important navigation feature for young readers to give them a sense of independent control. One of my favorite things with a read-aloud picture book is a simple way for users to listen to a page being read aloud again. What if a young listener wasn't paying attention for a moment. How easy is it to press the "replay" button, as it were? What if you want to listen to a song again? Can you do this easily, or do you have to go back a page and then forward again? The apps for Angelina Ballerina and Miss Spider's Tea Party, from Callaway Digital Arts, do a particularly good job of letting young readers navigate in an intuitive but clear way, letting them listen to a page repeatedly if they wish to. This is important, especially since these apps have quite a bit of text on one page. An interesting navigation feature that picture book apps are working through is how to present longer text on one page. Some picture book apps put all the text from a print book on one app page. Wild About Books keeps the original page layout from the books. This works well for the rhythm and rhyming of the book, but I find the font to be quite small for children to read along with the story or read by themselves. Some picture books, like The Competition from Piccolo Books, use turns within a page (with an arrow next to the text), as well as larger page turns (with page swipes or arrows at the top of a page). I wonder how well children use this more complex navigation. I would love your thoughts on the issue of navigation for children's book apps. What is important to you in terms of navigating a book app? What works well with children you've watched interacting with apps? I’m a school librarian, passionate about bringing stories and information to children in ways that will engage them and want them to read more. When we got our iPad in the spring of 2010, I was a bit sceptical - how were we going to use it? But I was quickly surprised how each one of us in our family started finding ways they really loved it. I’ve been amazed how iPad book apps can engage children with stories they knew, but adding and integrating new content, encouraging children to interact with stories, and enabling young children to read stories by themselves. Over the next week, I would like to take a break from reviewing specific books and take some time to start reflecting on what makes a Book App for children successful. Above all, I'd like to think about how books created in this new medium can engage children, can help them get excited about reading, can make books and information more accessible. This discussion came as a result of a presentation I led at last weekend's KidLitCon, and could not be possible without the immense creative help and thoughts of Paula Willey (PinkMe) and Betsy Bird (Fuse #8), my amazing, dynamic co-presenters. Below are my thoughts, but are shaped in huge part by both of their thinking on this subject. Two things fascinate me: how much does the medium shape our expectations? or are children really just interested in whether the story pulls them into the experience? When we read a book, we come to expect certain things. We turn the pages, we wait at each page and think a moment. Or we know we can flip the pages back and forth. When we open a webpage, we expect to be able to drag the scroll bar up and down, click our mouse on hyperlinks, and use the back button to take us back to where we started. So what are children expecting as they turn on an iPad? How do these expectations - usually developed, quite honestly, with games like Angry Birds - shape their reaction to Book Apps? You expect to poke something and have it respond to your actions. You expect it to change and move. Book apps are interactive computer programs based on books; specifically here, I am talking about apps sold for the iPad and iPhone through the Apple iTunes app market. There are also apps sold through the Android market for other tablets and smart phones, but because the Apple market is the largest (and the iPad is what I have), that’s what I’ll be talking about here. These are not ebooks, which are essentially reprinting of the text and pictures. They are interactive books, which means that you can poke or press different parts and they respond to your actions. What do you think are key features for a Book App that is geared toward children? 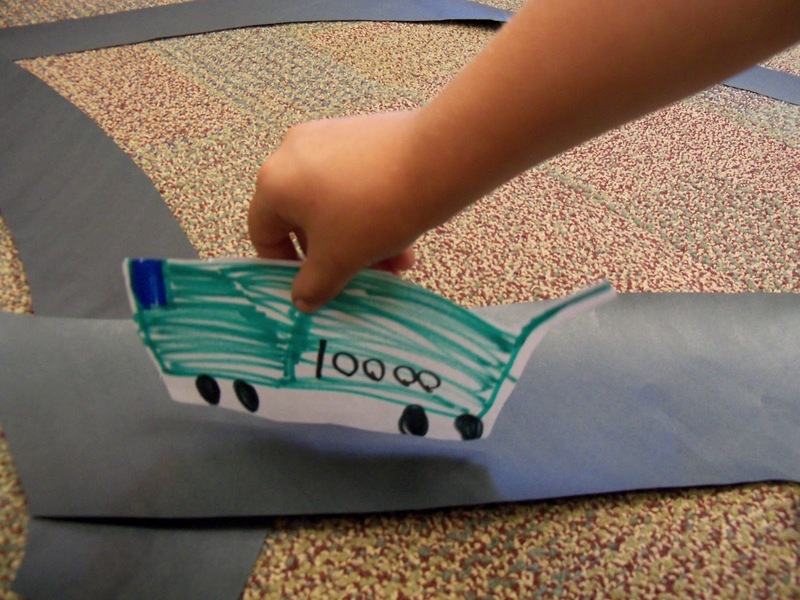 How can these interactive programs engage our children and develop literacy skills? What are some examples of the best apps you've encountered? To search out reviews I've done on Book Apps, click the "ebook" label on the right side of the blog (or click here). I love playing with books, and encouraging children to bring books into their imaginative world. Close your eyes and imagine you're driving to grandma's house. You can just imagine sitting in your car, watching all the buildings and cars pass out your window. What's that you see? A big construction site? Jackhammers hammering? Our ride just got much more fun! I've had a great time sharing Road Work Ahead, and helping kids play with the story. Here's a bit about this story, and a fun art project we did with kindergarteners. 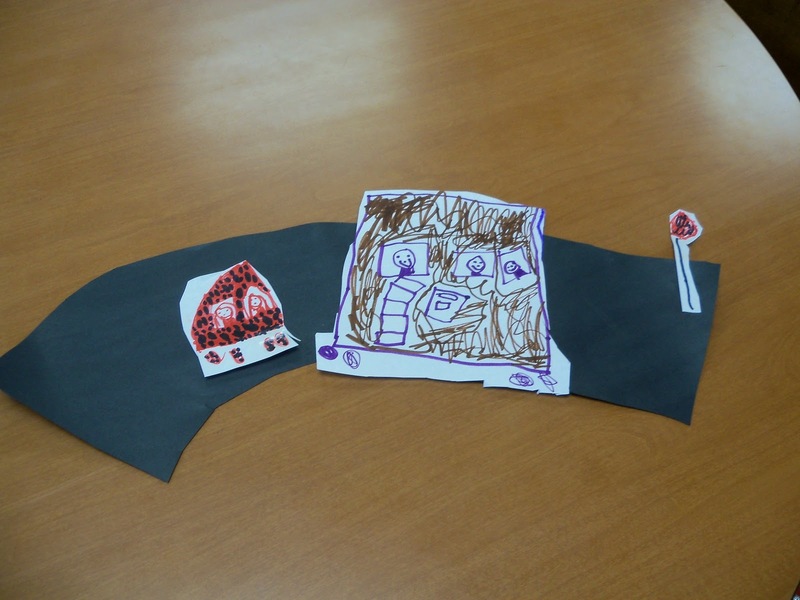 Children love drawing and making their imaginations come alive with their art work. After reading this story with our kindergartners today, we took some time to draw our favorite cars and construction vehicles. The kids loved this chance to draw. After they drew their pictures, they cut out the vehicles and had a great time playing with their cars. It reminded me of the hours and hours my brothers spent playing with their Hot Wheels. 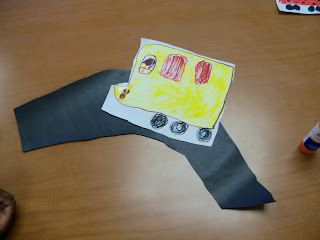 The kids had even more fun, getting to draw and create their very own vehicles first. The review copy of Road Work Ahead was kindly sent by Viking publishers, an imprint of the Penguin Group. For another great book to tap into children's imagination, check out Mitchell's License, by Hallie Durand and Tony Fucile. On September 11th, 2001, ten years ago today, shock rippled around the world as we grasped what had really happened. For me, I felt very removed from the horrific events. With young children at home, I only watched small amounts of it on television. But soon, oh so soon, we realized how this tragedy affected all of our lives. Last Friday night, I started thinking more and more about how to share this with my older children - now 10 and 12. They were too young at the time to remember any of what happened - this is now history to them, and yet a history very close in adults' memories. We were browsing in our local bookstore - Mrs. Dalloway's - and I bought a copy of 14 Cows for America. It's a beautiful book that helped us begin the conversation. Wilson Kimeli Naiyomah was a young man when he came to the United States to study, and he was in New York City on September 11th, 2001. The next spring when Kimeli returned to visit his family and Maasai tribe in Kenya, he still felt New Yorker's pain searing through his heart. Carmen Agra Deedy and Thomas Gonzalez tell Kimeli's remarkable story of how he and his tribe honored the people of America. Kimeli's elders taught him this lesson when he was a young boy in Kenya, and he recalled it as he sorted through his emotions after the devastating sorrow caused by the 9/11 attacks. He decided that he would offer a cow. "The cow is life," to the Maasai people. When he asked his village elders for their blessing, they too wanted to offer something, another 13 cows for the American people. These cows have remained in Kenya, taken care of and honored by this Maasai village, in memory of the pain and suffering that the American people experienced on September 11th, 2001. One of the things I like best about using this book to talk about 9/11 with children is that it does not focus on the disturbing images of the event, but rather on the effect and how we can react when tragedy strikes. I purchased this book for our home library from our local bookstore Mrs. Dalloway's, and will also purchase a copy for our school library. Our northern California weather is just taunting us every afternoon, with glorious sunshine that's begging us to keep in summer mode. And yet I'm amazed by how quickly we've zoomed into school mode - soccer practice, homework, early dinner, nightly reading (yay! ), and early to bed (fingers crossed). If you're longing for a whiff of summer, you'll love reading aloud The Penderwicks at Point Mouette with your children. This is the 3rd book in the Penderwicks series - an absolutely lovely series to read aloud with children, or for middle grade readers to read by themselves. With all of the grace and charm of she brought to the first two Penderwick books, Jeanne Birdsall’s third installment is satisfying and delightful. With their father and his new wife away on their honeymoon and Rosalind away on vacation with friends, Skye is now the OAP - or Oldest Available Penderwick. Batty and Jane are sure - well, almost sure - that Skye can do the job. But Skye is truly nervous, convinced she’s going to forget some crucial piece of advice that Rosalind gave her. As Skye, Jane and Batty head up to Maine with Aunt Claire, they are full of anger that Jeffrey’s terrible mother won’t let him join them. Their joy when he arrives is all the sweeter. Birdsall develops these central characters, allowing the younger Penderwicks center stage with Rosalind away in New Jersey. Skye learns to trust herself and her sisters as she finds that she can handle being the OAP. Jane falls madly in love, only to discover its bittersweet consequences, with all her dramatic flair. And Batty, well Batty survives just fine, makes a new friend, and discovers a lovely talent she has for music. While some may say that the plot became predictable, children will enjoy being able to figure it out right before the reveal. Overall, this was absolutely satisfying and delightful. If you'd like to get a sense of The Penderwicks at Point Mouette, take a look at this first chapter, available as a preview through Google Books. The review copy was kindly sent by the publishers, Alfred A. Knopf and Random House. Links above take you to my favorite local bookstore, Mrs. Dalloway's. Please support local independent bookstores, online or near you. Labor Day Weekend is indeed the last remnants of summer, a time for families and neighbors to enjoy together before the wild rush of September overtakes us. One of my favorite picture books of the summer was Blackout, by John Rocco. I love it every time I read it. Summer. City. Family. Magic in the ordinary moments. It's a special treat, indeed. Every time I see this book, I am completely drawn in by John Rocco's cover. The magnificent deep blue-black night sky, the shining stars, the people on a rooftop -- all make me want to stop whatever I'm doing and just spend a moment with this book. As you open the story, you'll see a typical family with everyone busy on their own, on their phone, at their computer, in their own little space. But all of a sudden, the power goes out. Not just for that family, but across the whole city. As the family adjusts to the power being out, they come together, start to play a board game, and then move up to their building's rooftop. "It was a block party in the sky." On the sidewalk below, people gathered and visited, neighbor with neighbor, sharing melting ice cream and making impromptu music. "And no one was busy at all." "It is not often, in this digital age, that we get a chance to stop, to really stop, and just be. Be in the moment. Be with our families. Be with our neighbors. Be with our community. Sometimes, when the lights go out, it's a good thing. It can be magical. This is a book about a family who discovers that magic during one hot summer night in the city." Rocco tells this story with wonderful illustrations, many broken into sequential panels almost like a graphic novel or comic book. I think children and families will really respond to this book, as it evokes the best of being together on a summer night. I enjoyed watching John Rocco's book trailer for this book. He's combined interviews with New Yorkers who remember the city-wide blackout of August 2003, along with pictures that give you a sense of the book and story. Read a fantastic interview with John Rocco at Seven Impossible Things Before Breakfast. Blackout is one of my favorite books of the year. The links above take you to my favorite bookstore, Mrs. Dalloway's in Berkeley, which now has an online store.